Halloween might be over, but that doesn’t mean pumpkins are off the menu. 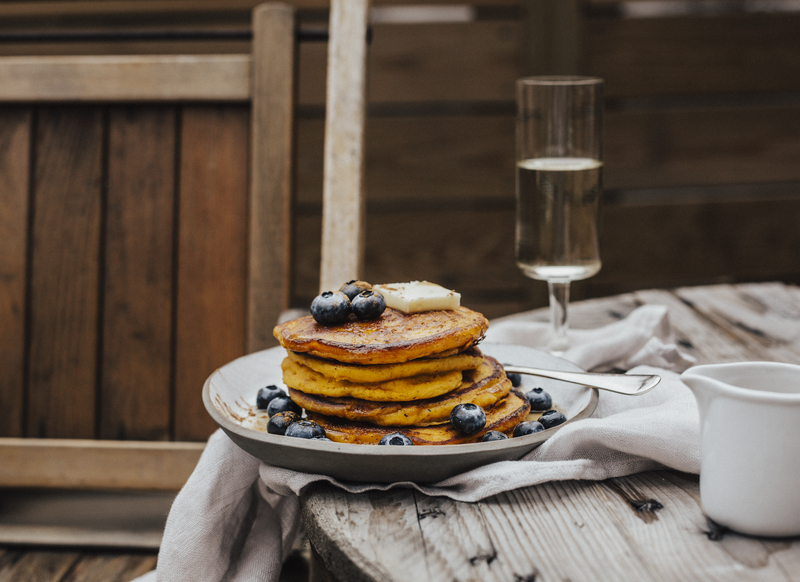 They are so versatile: from stuffed pumpkin and pasta to pancakes and waffles. 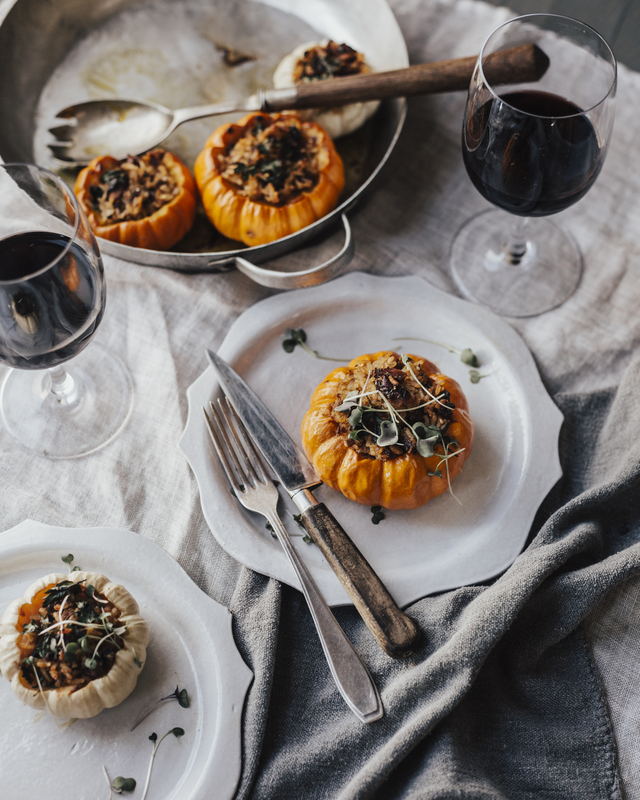 It’s easy to make use of your leftover pumpkin – all paired with Bordeaux wines, of course. Here are three pumpkin recipes you’ll love. Roasted pumpkin is delicious on its own, but it tastes even better stuffed. For this recipe use either mini pumpkins (like we did here) or a whole pumpkin (1kg). Make this dish fully vegan or add minced meat, sausage or goat cheese – it’s up to you. Mushrooms work really well here too. Heat oven to 200C/180C fan/gas 6. Cut the top off the pumpkins and use a spoon to scoop out the seeds (keep these – you can roast the seeds later). Place the pumpkins on a baking tray, rub each with a bit of olive oil inside and out, and season well. Roast for 20 mins or until tender. Heat 2 tbsp olive oil in a frying pan, add onion and cook over medium heat until translucent. Add the garlic, stir and cook for another minute. Add the brussel sprouts, thyme, bay leaf, season with salt and black pepper and cook for 1 minute, until you can smell the herbs. Add in wild rice, vegetable stock, pecans, and cranberries. Bring it to a boil, then turn heat to a simmer, cover, and cook until the wild rice is plump and al dente (30-35 minutes). Pack the mixture into the cooked pumpkin and return to the oven for 15-20 minutes until everything is piping hot. Serve immediately. For a vegan option of this dish a Sauvignon Blanc, such as Dourthe Réserve Sauvignon Blanc or a Merlot, such as La Croix de Bordeaux would work equally well. When adding minced meat or sausages, we would recommend a Bordeaux Merlot. 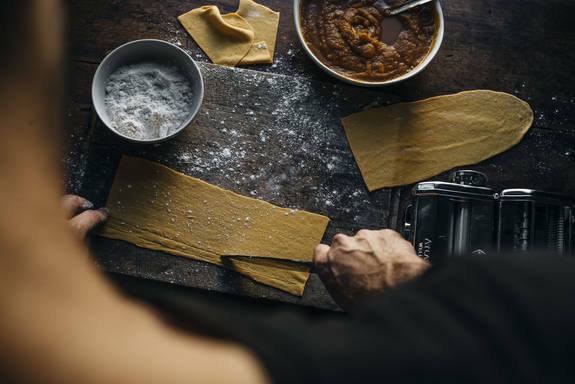 Have you ever thought about making homemade pasta, but feared it would be too complicated? Not to worry. Today we’ll walk you through a simple yet ingenious recipe that’s ideal for guests at a dinner party, but also simple enough for a quiet night at home. It”s even vegan, so it works for just about everyone. You only need two ingredients: flour and pumpkin puree. Pumpkin has many great properties, and in pureed form it happens to be great for binding flour, much like an egg would do. 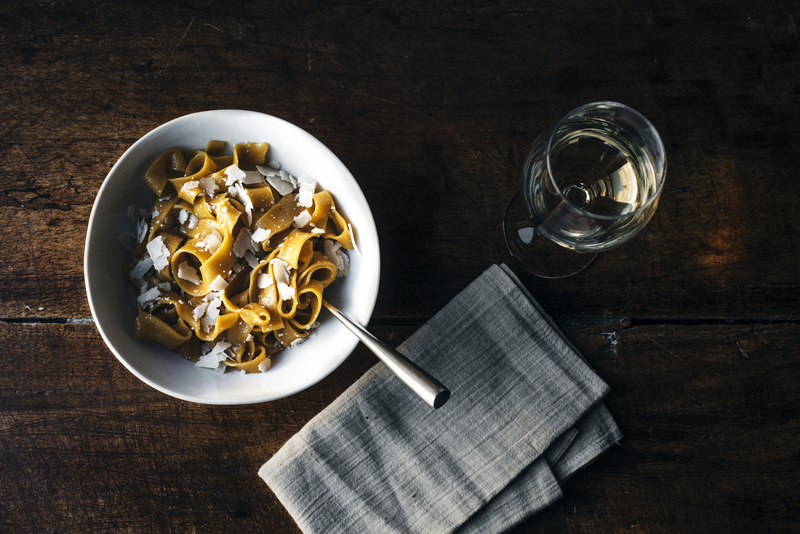 Pasta made this way tastes so good that it can simply be served with melted butter and some Parmesan cheese – and if you want to keep the dish vegan, you can also serve it with olive oil and roasted pine nuts. Cut the pumpkin into smaller pieces and cook in hot water until soft. Pour out the water and finely puree the cooked pumpkin. On a clean surface, sprinkle flour and form a hollow in the middle. Add the pumpkin puree and mix with the flour while kneading. Add more flour as needed so the dough doesn’t end up sticky. When a firm kneaded ball has formed, cut it down the centre and cover one half so it doesn’t dry out. Roll the rest of the dough out until it’s so thin it’s almost translucent. With a pizza roller or sharp knife, cut the dough into 1cm wide strips. Bring salted water to a boil, add your pasta, then drain and serve with the sauce of your choice. This dish pairs perfectly with a glass of dry white Bordeaux Château Peyreblanque – or any other white wine from the Graves region – whose light acidity adds a wonderfully refreshing touch. For a somewhat more unusual wine choice, go with a light red Bordeaux wine like the Château Malbat, which rounds out the pumpkin pasta with fine fruit flavours. 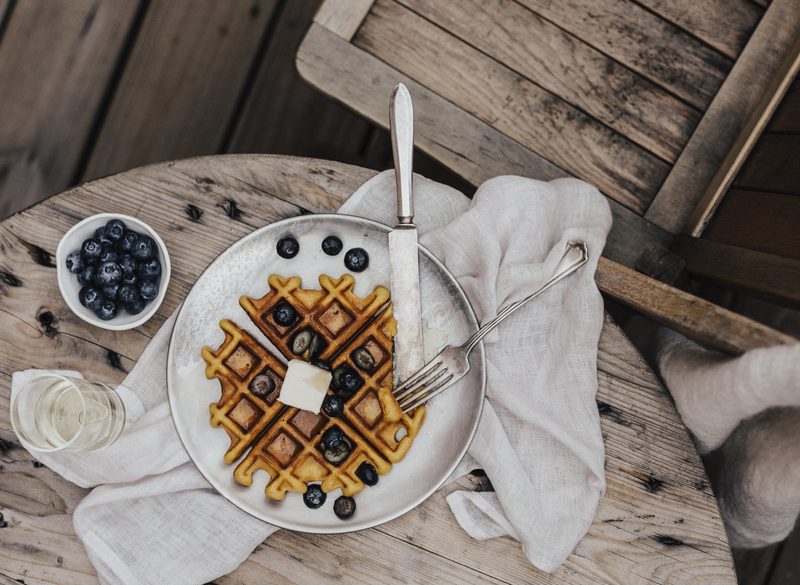 If you want to treat yourself and your loved ones to something very special for breakfast this weekend, this recipe for pumpkin waffles ticks all the boxes! Method1. Cut the pumpkin into small pieces and cook in water until the pumpkin is soft. 2. Puree the pumpkin with a hand blender. 3. Add the coconut oil, sugar, two egg yolks and milk to the puree, and stir until everything is mixed smoothly. We recommend using a mixer for this.4. Add cinnamon, nutmeg and vanilla. 5. In another bowl mix the flour, baking powder and salt, then add the puree mix and mix everything together again.6. Pour the dough into the preheated waffle iron. Cook for about 3 minutes per waffle. 7. Serve with butter or maple syrup, fresh berries fit perfectly too. 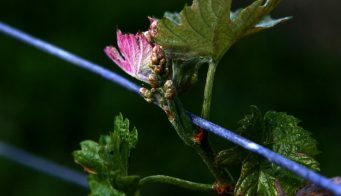 A fruity, sparkling Crémant de Bordeaux such as Les Cordeliers, with its crisp acidity and long finish, will make this dish a hit for the whole family. And what do you do if there is still dough left? Just make pancakes out of it! Pour the dough into a pan and cook on each side for about 2 minutes. Time to pick up a pumpkin? Whether you’re overloaded with pumpkin leftovers or need to buy another one, we’re sure you’ll agree that all of these recipes look delicious. Give them a go and let us know how you get on.